The "dhswaffle" is a cross between a waffle and a dosa. The best part of eating brunch is the shameless, hedonistic mixing of savory and sweet. 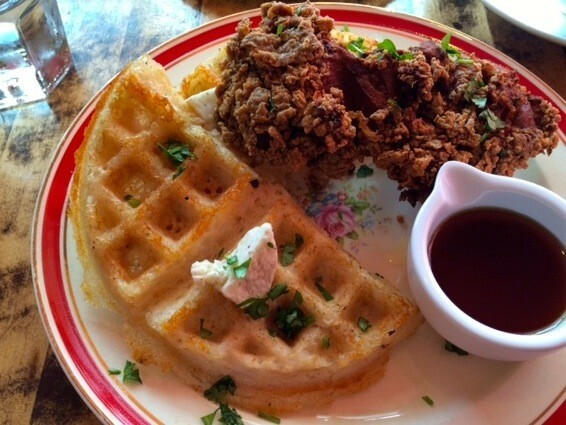 And, when done well, there’s no brunch dish that captures that interplay quite as beautifully as fried chicken and waffles. Although the dish is rooted firmly in the African-American soul food tradition, I’ve recently seen variations on the theme popping up at all different kinds of restaurants in the East Bay. It’s a trend I can get behind. A side of tikka masala sauce rounds out the dish. 1. Perhaps the most memorable chicken and waffle dish I’ve had in recent months was at Tigerlily (1513 Shattuck Ave., Berkeley), a California-inflected “Indo-Asian” in North Berkeley at which chef Joel Lamica serves turmeric-infused, buttermilk-battered fried chicken and pairs it with waffles, maple syrup, and Indian tikka masala sauce. It’s a brilliant, utterly addictive combination. 2. As it turns out, Indian flavors just make a lot of sense in the context of chicken and waffles — something about the way the spices make that sweet-and-savory contrast even more enjoyable. Never a place to shy away from the heat, Juhu Beach Club (5179 Telegraph Ave., Oakland) serves green-chili-infused fried chicken and spicy maple syrup in its version of the dish (see photo at the top of the page). But the main innovation is what chef Preeti Mistry calls the “doswaffle” — a gluten-free cross between a Belgian waffle and a South Indian dosa (lentil crepe). Essentially, Mistry cooks traditional dosa batter in a waffle iron. What you wind up with is a surprisingly well-balanced dish. The dosa’s fermented tang and the various spicy elements in the dish help to balance out its sweetness. 3. 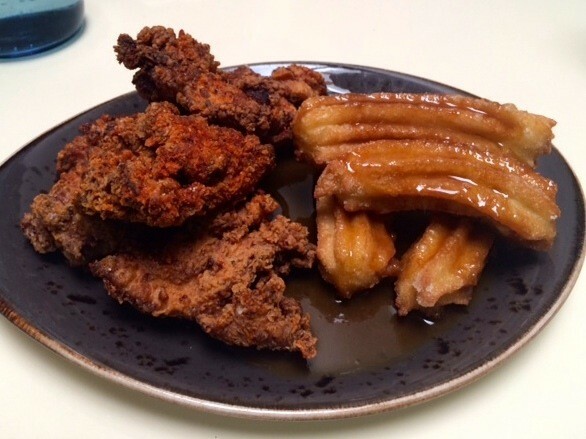 At Shakewell (3407 Lakeshore Ave., Oakland), on the other hand, the dish has been reinterpreted through a Spanish lens — with delicate, fried-to-order churros acting as a stand-in for waffles. What I loved was the chicken: boneless thigh meat fried to a perfect juiciness, well salted, and redolent of smoked paprika. 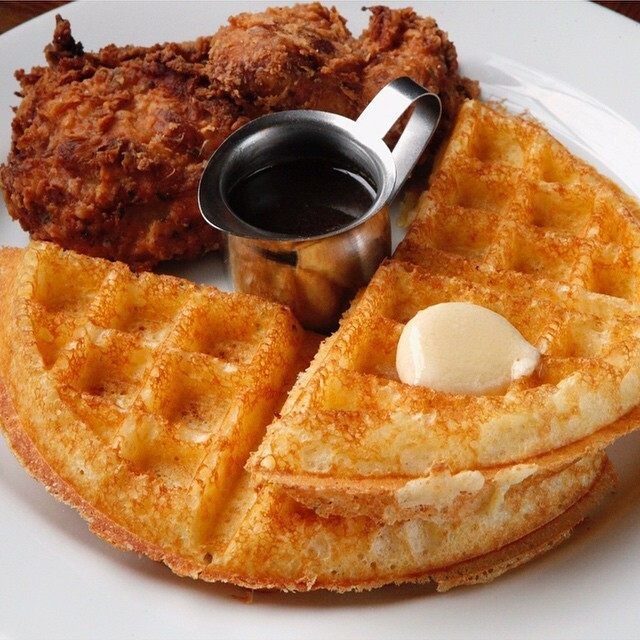 It nailed what is perhaps the biggest key to successful chicken and waffles: The savory elements need to be really savory; otherwise, the addition of syrup — in this case a vanilla-infused buttermilk syrup — will cause the dish to skew too sweet. A classic since 2008 (via Facebook). 4. No roundup of East Bay chicken and waffles dishes would be complete without mentioning the queen of them all, Brown Sugar Kitchen’s (2534 Mandela Pkwy, Oakland) relatively traditional soul food version, which has been winning hearts and minds since chef Tanya Holland opened the West Oakland breakfast and lunch spot in 2008. Holland’s version is all about the waffle — crisp, greaseless, and so impossibly airy and light that the chicken almost becomes an afterthought. 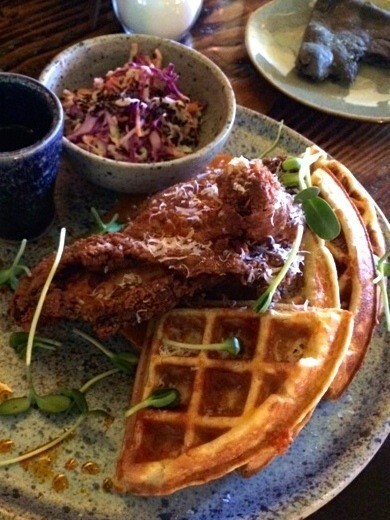 On my list to try next: the seitan-based chicken and waffles at Souley Vegan (301 Broadway, Oakland), which recently relaunched Sunday brunch service, and Gussie’s Southern Table and Bar (2021 Broadway, Oakland), the forthcoming soul food restaurant at which chicken and waffles will be the star attraction.